HONG KONG, Apr 30, 2018 - (Media OutReach) - MetLife Hong Kong* has won the Outstanding Use of Digital Technology Award at the 18th CAPITAL Outstanding Enterprise Awards. The award is a testament to MetLife Hong Kong's excellence in enhancing customer experience through digital innovation and the integration of InsurTech. Mr. Lee Wood, Chief Executive Officer of MetLife Hong Kong, said, "We are honored to receive this award that recognizes our continuous efforts in technological innovation. As our customers' trusted advisor, MetLife Hong Kong is committed to providing greater value for our customers. This Outstanding Use of Digital Technology Award serves as a great motivator and endorsement of our persistence and success in driving product service and excellence through leveraging data insights and digital technology." The award honors MetLife Hong Kong's leadership in embracing InsurTech to deliver on its commitment to making universal medical protection accessible to underserved groups. Using innovative technology, MetLife Hong Kong has made a pioneering move to extend the scope of its medical protection plan to include people living with diabetes, a traditionally underserved group. MetLife Hong Kong has also partnered with Health2Sync to provide InsurTech solutions for our customers to better self-manage their health. MetLife Hong Kong also rewards those who successfully manage their diabetes with lower premium rates. The annual CAPITAL Outstanding Enterprise Awards, organized by CAPITAL Magazine, recognizes Hong Kong and Greater China enterprises for outstanding achievements in areas including customer experience, use of technology, marketing effectiveness as well as product and service innovation. 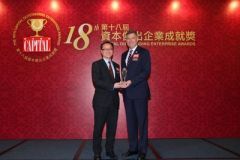 Mr. Lee Wood, Chief Executive Officer of MetLife Hong Kong (right) received the Outstanding Use of Digital Technology Award on behalf of MetLife Hong Kong.